After all, not every shoe is created equal. You could buy a size 8 in a sandal, a stiletto, and pair of boots and every single shoe would fit your foot totally different. Some shoes being a little too big, some too small, and some that fit just right. The problem is that shoes that do not fit properly can throw your balance off, make you walk funny, and even cause you to develop ingrown toe nails and bunions. Here are 8 hacks that will help you the next time you decide to buy a pair of shoes and even adjust the ones that you have, so you can feel more confident in your shoe game and still walk comfortably in style. Try using one of the available apps available for your smartphone or tablet. vFit and Right Shoes are two that we like. 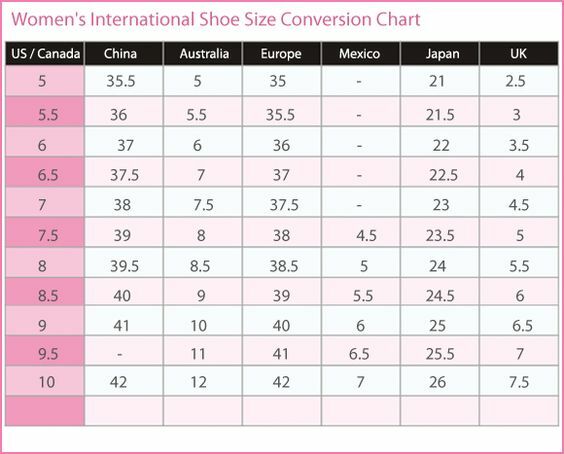 Size will always vary by shoe and brand but this easy to download and print chart will help you easily reference your shoe size amongst various countries and also comes in handy when ordering online or trying to save money on a pair of expensive heels or sneakers! Going shopping for new shoes or a special occasion? For the best fitting shoes, go in the evening rather than in the morning. According to source in the Wallstreet Journal, that's when your feet are at their biggest throughout the day. Not to mention, it's always better to size up than down in shoe size so your shoes don't pinch and bruise your heel. There are tons of styles of shoes to choose from but depending on your shoe size, foot width, and comfort level your feet may fit better and feel better in one style of shoe over another. This also helps when searching online to find more exact results and shoes that better match your preference and needs. Sometimes no matter how hard you try, some shoes just won't fit perfectly on your foot, especially when it comes to high heels. If you size down, the shoe pinches your heel. If you size up the shoe slides off your heel every time you walk. But there's an easy fix for this and it's called Sticky Shoes. Sticky Shoes is a double-sided shoe tape that is designed to keep heels and flats perfectly on your feet when you walk. It's great for special occasions or just a regular day in the office and makes every pair of shoes the perfect fit. Interested in trying Sticky Shoes? Click here to claim your free sample. Did you know that you can stretch out your shoes with just a little water and freezing action? Apparently, it's a thing! Here's a good post on how to do it in case you have any shoes that are just a bit too snug. Sometimes your shoes fall apart after a long-night out at the clubs or a five-hour wedding ceremony. That's where Shoe Goo comes to the rescue! This stuff is shoe-lovers dream for fixing damaged soles or repairing broken heels.